After an exhausting walk all over the city of Bari, I returned to MSC Preziosa and discovered that my request to interview the cruise director not only had been honored, but would occur almost immediately. Rushing around like a mad woman, I freshened up and headed one flight down to the Top Sail Lounge, the private lounge in the MSC Yacht Club to meet up with MSC Preziosa cruise director, Francesco Pili. After a brief introduction and grabbing a quick beverage from the waiter, we settled in for our conversation. Travel Shop Girl: How long have you been with MSC? Franceso Pili: It will be 10 years now very soon, the 4th of October. TSG: What position did you start out with? FP: I started immediately as cruise director because I was a cruise director already for 14 years before. TSG: But you didn’t start out as cruise director in prior jobs. You had to work your way up? FP: I started with Chandris, the mother company of Celebrity. I started as an Assistant Cruise Director, but that time the ships they were very small. So the cruise director and the assistant cruise director were one of the artists. The cruise director was a magician and I was a singer; country rock; guitarist and singer, and at the same time, Assistant Cruise Director. TSG: Do you still perform now? FP: No, not anymore unfortunately because I used to love it. I’d been a professional musician for 10 years before that on land. I used to tour around Europe. TSG: Between both jobs, you basically moved your life to sea then? FP: Actually now, this year, December this year will be 25 years at sea. Next year in December, I will be 25 years cruise director. TSG: That is amazing. Congratulations! Especially as most probably don’t stay on in the job that long. FP: My wife, we travel together for many years. I met her in ’97 and we’ve traveled together for many years. She was a dancer in the theater. We now have a four-year old baby – she’ll be four in October and they’re at home. This is the difficulty now. I love the job. I think it is amazing to work especially the ships as today they are floating, traveling cities. TSG: Absolutely. These ships are huge. FP: These places are five times bigger than the village where I live. I live near Verona in the hills, and it’s only like 800 people. TSG: Compared to what the ships where when you first started, it’s like night and day. I mean even if you look back 10 years, there are so many changes that have occurred in the cruise industry. FP: I think they’re much safer than the small ships. They’re much safer, much healthier. The modern technology allows those ships to have always have clean air, the nice ambience, and the right temperature. They’re wonderful, comfortable, luxurious, beautiful, sophisticated, elegant ambience. TSG: There’s a small percentage of people who haven’t cruised who might think, “I’m going to get seasick.” Of course, with the large ships you never feel the movement at all. You’re used to it now. I’m sure it doesn’t even phase you. FP: When I go on land, the land moves. TSG: With regard to your specific duties, do you do scheduling or is that taken care of by somebody else? FP: I do the scheduling. One of my duties, which takes quite some time is to schedule the group’s activities and to put them in harmony with the general entertainment activities and the life on board for all guests. The schedule for the staff, let’s say for the artist, is fixed. They have a production coordinator — because it’s a production company, and she makes the schedule for if they have just a few extra duties like library and so on. The dancers have some extra duties, for example, they perform after the shows late evening in the lounge. They participate in a dance contest with guests like Dancing with Stars, which we call Star Dust. It’s like Dancing with Stars, but our version. The production coordinator takes care of this kind of scheduling and I have a chief entertainer who has a group of about 14 entertainers. He takes care to schedule the different duties for the entertainers groups. The staff does also embarkation duty, guiding guest and the flow of the people; stuff like that. Activities, he takes care to schedule these things, and then I have another chief entertainer for youth entertainment. She has a group of I think now eight entertainers and she organizes and schedules the duties for the youth entertainers. I have an assistant who helps me to schedule duties for example, for the group of social hosts. They have duties such as translations and disembarkation and embarkation duties. He schedules the duties for the social host. Then I have a chief technician. He schedules the duties for the various technicians to attend activities and stuff like that, so basically, it’s a lot of scheduling because it’s a group of nearly a 100 people. They’re all different. Entertainers that do this, and everybody’s doing something different. TSG: But it’s a well-oiled machine. It has to be in order to work. FP: It’s very well oiled. I have a subgroup leader let’s say who does the scheduling for me. Of course, my duties as their supervisor is to make sure all duties are covered and that the people perform according to our standards. That’s true, but also there with the assistant together, assistant cruise director, we are always around, and in the office scheduling, checking, and stuff like that. TSG: Right. You probably enjoy the more hands on dealing with the guest and emceeing, and those duties, I’m sure?. FP: Of course. This is one thing let’s say has changed a lot from the past. In the past, you didn’t have internet, you didn’t have mobile phones. I didn’t have even a radio, I remember in the beginning, so basically, you had less stuff. I was doing all the activities. I had the assistant, but the assistant didn’t cover the languages, even for the ships in the Caribbean because we have mostly Americans. But we still have significant numbers of Europeans or Latin Americans who of course, appreciate to be spoken to in Spanish. So cruise director with MSC, he must cover at least five languages. TSG: So, how many do you speak? FP: I speak seven, but I’m fluent in five. Of course, I speak Spanish, but I don’t speak Portuguese, for example. TSG: As far as the languages are concerned on a cruise like this where you do have so many people from so many different countries, is the entertainment planned to be different to encompass or to be able to entertain all those different groups? FP: I calculated that we have approximately like 25 languages, probably even more, and of course, speaking five languages is like a drop in the bucket basically. But we have unusual languages like Turkish, and Chinese, Japanese, Russian, Croatian, Ukrainian, Danish, Dutch, Swedish, Czech. Of course, many of them understand basic English. Some of them—they’re good in English. So the communication—I mean when I speak during my presentation in theater, I greet in something like 15 or more languages. So greeting and acknowledging the people already helps a lot. You acknowledge them, say good evening, and when I close an evening and I say thank you, I say thank you in 25 languages. When I speak during my presentation in theater, I greet in something like 15 or more languages. When I close an evening and I say thank you, I say thank you in 25 languages. FP: I think that one added value to the cruise is to be treated with genuine, sincere hospitality; warmth. It’s an added value. I always try to compare when I come into a hotel the way they receive me, so I’m very, very aware of that. I’m aware that we have to treat the people—that’s what I say to my staff always when I do my trainings concerning guests. What is a guest? It’s a specific training you have to do. You have to treat the people as if they were guests in your house. How would you treat them? Would you smile at them? Would you be welcoming? That’s all. Try to imagine. Take your imagination and take it there. You treat the people as if they were your guests in your house. I’m aware that we have to treat the people—that’s what I say to my staff always when I do my trainings concerning guests. What is a guest? It’s a specific training you have to do. You have to treat the people as if they were guests in your house. How would you treat them? Would you smile at them? Would you be welcoming? That’s all. Try to imagine. Take your imagination and take it there. You treat the people as if they were your guests in your house. TSG: What would you recommend to someone interested working on a cruise ship? Do you have any advice or recommendations? FP: One thing—say I take myself a little bit as an example, but I think that nowadays—of course, it also depends also in which department on a ship, but I’ve seen that all companies now, they are looking for people who have language skills. So I think one winning thing is to speak a second or third language. It doesn’t matter so much which one, but we see that nowadays on the ships, we have 35 different or more nationalities. The most I’ve counted till now was 80 different nationalities, so imagine how many languages. The most requested languages are, of course, apart from English; German, French, Spanish, Italian, and then to follow, Portuguese because the Brazilian market is in huge expansion, and then of course, Chinese, Japanese. My advice is to work on language skills and then, of course, to have professional experience of some kind. It can be as a waiter or as cruise staff. So I think one winning thing is to speak a second or third language. It doesn’t matter so much which one, but we see that nowadays on the ships, we have 35 different more nationalities. The most I’ve counted till now was 80 different nationalities, so imagine how many languages. TSG: What’s your favorite port on this itinerary that we’re doing? FP: I have to be honest. I have more than one favorite port here. It’s an itinerary that I’ve done many, many, many times with many different ships. This is the fourth ship that I’ve worked on with the same itinerary. My favorite port absolutely is Istanbul. Istanbul, we’re talking about the ancient, the Constantinople. It’s a city, which is so full of history and full of interesting things. I love the city. I would go to live there. TSG: Is there something you miss from home? I already know it’s your wife and your daughter so then we’ll say is there a specific food item that you miss while you’re traveling on the ship or do they have everything here for you? FP: I have to be very honest about that. I eat much better when I’m on the ship. Of course, at home, I can eat what I want, but also here, I can eat what I want. One thing that I perhaps I miss is the cakes, the special cakes that my wife makes. She’s a very good baker. She makes fantastic cakes, and very special, and sometimes we create them together from our ideas: How about making a cake like this and that? But being on this itinerary, sometimes she comes with her cakes. TSG: So you get the best of both worlds? I like that. FP: You see before I was a meat eater—I don’t eat meat anymore for various reasons. Mainly ethical reasons, but it’s my personal thing. Before, when I was eating meat, I used to miss the roasted pork as we do it in Sardinia. I’m from Sardinia. One traditional dish is a suckling pig, only six kilos big, roasted on charcoal two hours very slowly like this. My mother used to make that, and the way my mother makes the lobster, this is also unbelievable. The fresh fish of Sardinia from Sardinia waters, fished in the sea, the lobster the way my mother makes it and the suckling pig. Okay, the pig not anymore, the lobster still, yes. TSG: Do you have a hard time eating as a vegetarian on the ship? FP: No, not at all. Because I know the menu so for me it’s not difficult because you need some time to find out things also. It also depends whether you eat eggs or if you eat fish. I eat eggs, fish, and cheese. Cheese, I try to limit, but I love cheese. Honestly, I eat much better here. I have to be honest because to eat with the choice that I have here, at home, I would spend half of my salary. Do you know how many fruit I have to choose? I cannot buy that many fruit because it would be impossible to eat them to have that choice. Okay, I can go one day, I buy this, and I buy this, and I buy this, but not have every day this choice. So, basically, I have a lot more choice when I’m here. Honestly, I eat much better here. I have to be honest because to eat with the choice that I have here, at home, I would spend half of my salary. 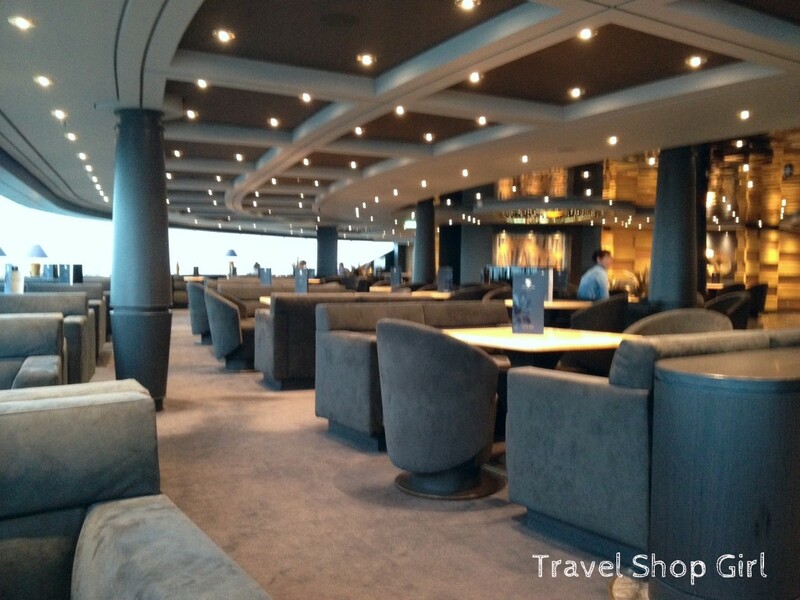 TSG: Do you have advice you for passengers or anybody cruising with MSC Cruises for the first time? FP: Different things—especially here, we have different things that as a first timer, I would try absolutely if I never tried before. 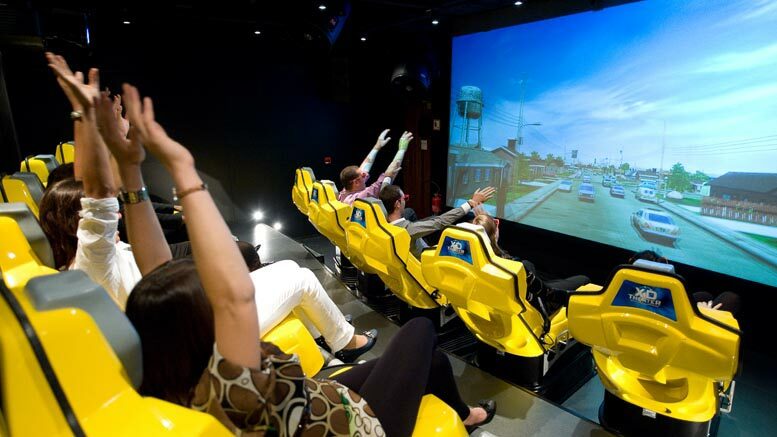 It sounds a little bit—how can I say; a little bit silly, but to try the 4D Cinema. Did you ever try that? TSG: No, I haven’t. I definitely would like to. FP: Believe me, go and try, The roller coaster, it’s amazing. If someone never tried before, this is really one thing to try because it’s fun. Then for evening entertainment I wouldn’t miss one show if I were a guest. The shows —I think they are very, very good quality and are very well made. They really take care of it all the time and they’re renewing continuously things. The shows, they have a lifespan of let’s say five, four years, let’s say. The life span of the costume more or less. The costume after four years, they are worn out. You make new costumes okay, then you might as well make a new show, so every four years the shows are renewed. There is a continuous renewal of the shows. We have two production companies and both of them, they are a little bit healthily competing with each other for best results, and they always come up with new ideas every year. TSG: I think that’s really good because it makes each of them work harder to compete together for their spot. FP: I think the shows have a very good quality, and the artists are very good artists, so that’s very good. That’s one thing also to go and see every evening. Another thing to try is perhaps, of course, every day you have your culinary experience in the restaurant or at the buffet, whatever. Certainly, I would on this ship in particular, would go and try the Italian restaurant Eataly. I have a small allowance and part of my allowance goes there. TSG: I have to say that place is insanely amazing because I tried it on the Divina and I was blown away. I immediately wrote about it and I said it was the best food I’ve had anywhere cruise ship or not. I am so impressed with the quality. Although, I was upset because I had seen the sign saying there was one in town, but I couldn’t find it. FP: The one in Bari. TSG: We just kept walking and couldn’t find it and then I thought we was going to come back late so we just called it a day, but I’m really glad it’s on here. I think it’s a great partnership, absolutely. The food was really good. FP: Very good. And they also have very good wine, Oltre Il Rosso. It’s not without sulfates; it’s with less, but it’s very, very good. I don’t know if you drink wine. You buy this Oltra Il Rosso, for example, it’s very affordable, 17 euro. I think a half liter bottle for two people, it’s perfect. It’s like two glasses; two or three glasses; really affordable and very nice. You’re out there and you eat this fantastic pasta, this pesto – amazing. TSG: And you’re from Italy so for you to say it’s really good, I know I have to have it now. I’ve met my share of cruise directors who range from the over the top, ego driven types who are their number one fans to the rare ones like Francesco. Personally, I’d take Francesco over most others as he’s doing his job because he has a passion for it. That, above anything else, speaks volumes. 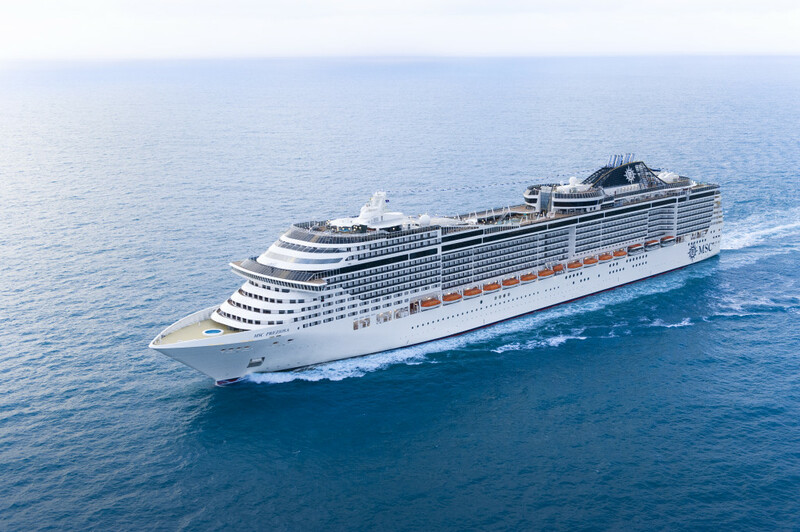 Kudos to MSC Cruises for finding the best possible cruise director for the MSC Preziosa. 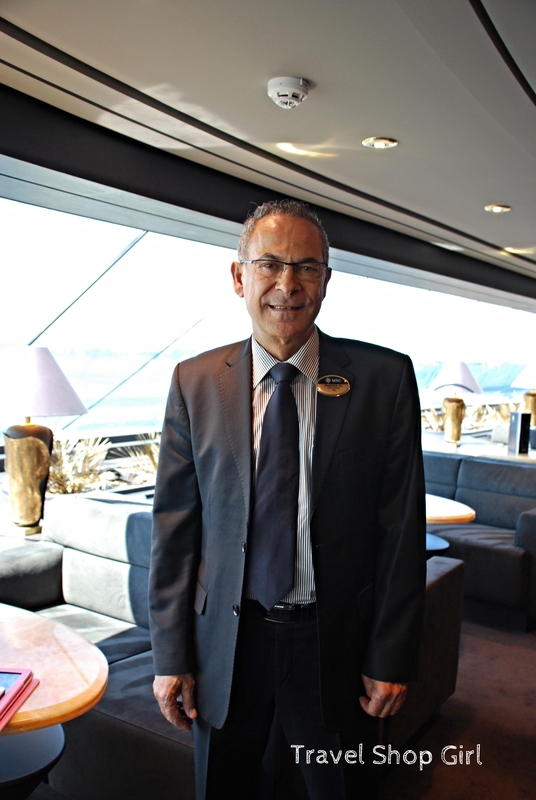 A big thank you to MSC Preziosa cruise director Francesco Pili and MSC Cruises for allowing me the opportunity to sit down with one of the most charming and interesting cruise directors I have ever had the chance to meet. 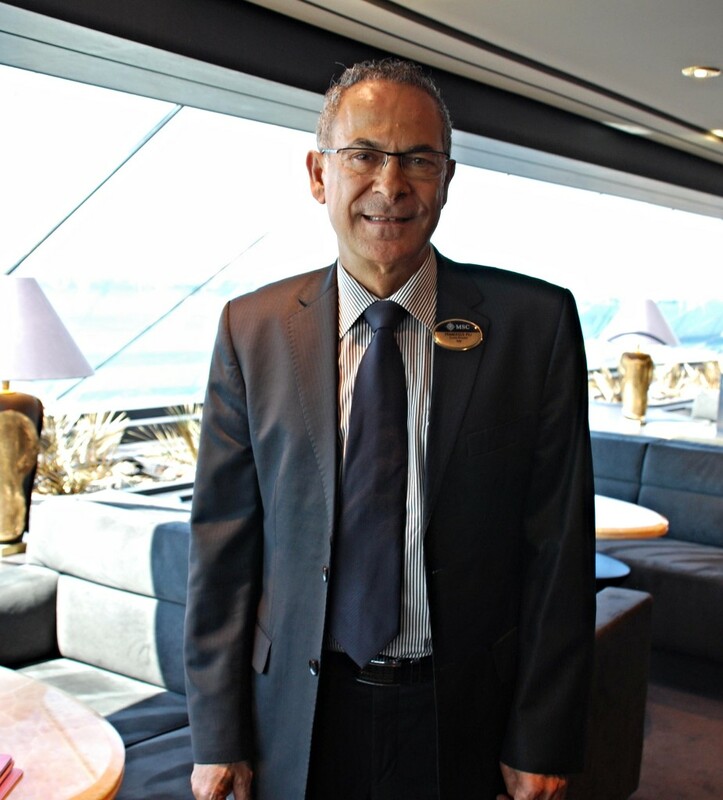 I saw it firsthand how he treated every guest as an individual and greeted them with the warmth and sincerity one might never expect on a “floating city.” The next time you think a cruise director is there only to lead games by the pool, think again and think of Francesco Pili. I think that one added value to the cruise is to be treated with genuine, sincere hospitality; warmth. It’s an added value.